Maybe that “mental disorder” crack was a bit too much? Seriously, it’s hard to decide. 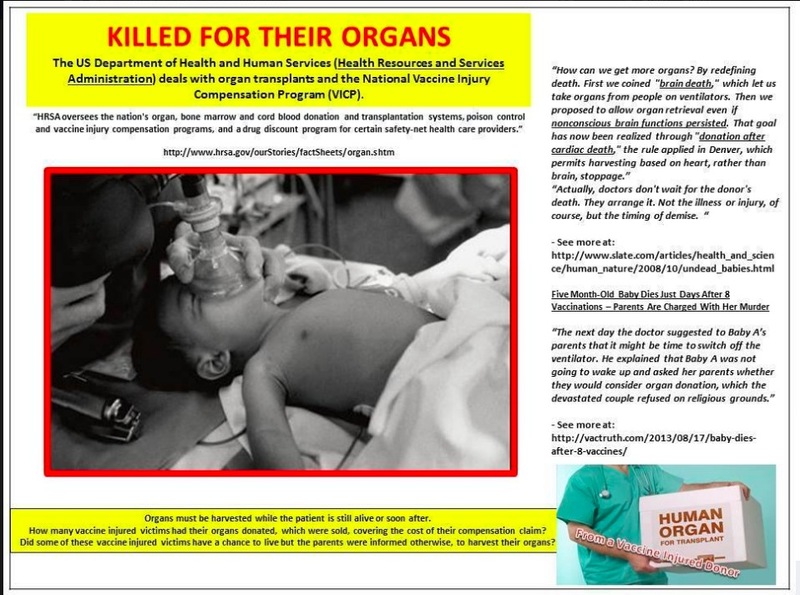 See, because the Health Resources and Services Administration (HRSA) within the US DOH runs both the Organ Procurement and Transplantation Network and the National Vaccine Injury Compensation Program, then HRSA must be taking organs from “vaccine injured” children and selling those organs to the highest bidder. 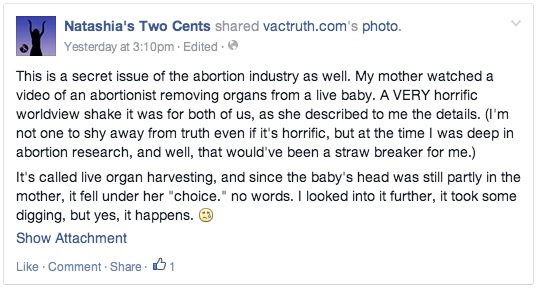 That’s why we must have such a small number of people needing organ transplants… Oh, wait. To people that are seemingly divorced from reality, no conspiracy theory is too outlandish not to believe it. Between this and the reasoning of the Supreme Court, I think we’re in trouble. 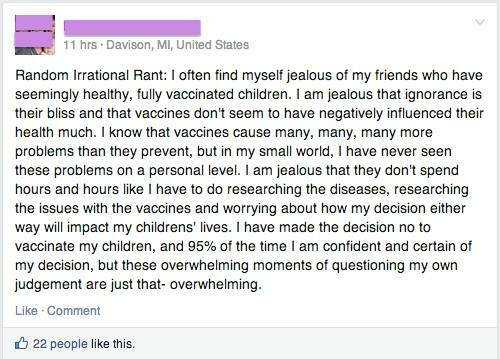 This woman worries so much about vaccines that she spends “hours and hours” in “researching the issues with the vaccines and worrying” about nothing. 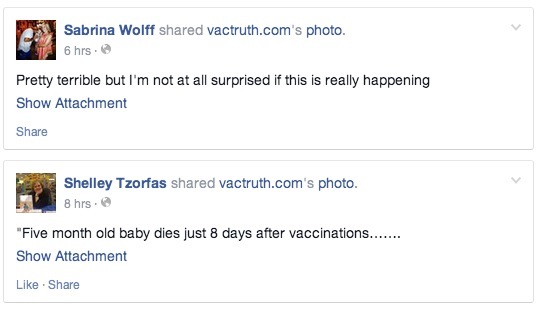 Notice how she has not seen any of the bad things that she has convinced herself (or has been convinced of by anti-vaccine celebrities), but she still wants to believe in them. She still knows through her “research” (which probably does not include any kind of coursework at an accredited institution) that vaccines are horrible. But, when she looks under the bed and doesn’t see a monster, it is “overwhelming” to her. Read it for yourself. Because vaccinated children around her are not “lost” or “stolen” by vaccines she is overwhelmed. She is in a state of panic that, through her own admission, is irrational. If this is not a mental disorder, I don’t know what it. Sadly, this is par for the course for many people who want to believe in the lies that they’re told about vaccines, the government, aliens, whatever. If they are true believers and they are confronted with something that is tangible, that they can see for themselves but doesn’t fit their view of the world, they feel overwhelmed. It’s like the devout person who follows a messiah that turns out to be human. Their ego can’t take the blow, so they try to rationalize it. This is not the case with a truly rational person. A truly rational person sees the facts and accepts them for all that they’re worth. Rational people don’t freak out because the Earth revolves around the Sun. They don’t call for someone’s head because the science shows itself in everyday things more than their irrational beliefs. I feel really sad for this woman that she has to worry her mind with these things when she could be doing much more productive things. 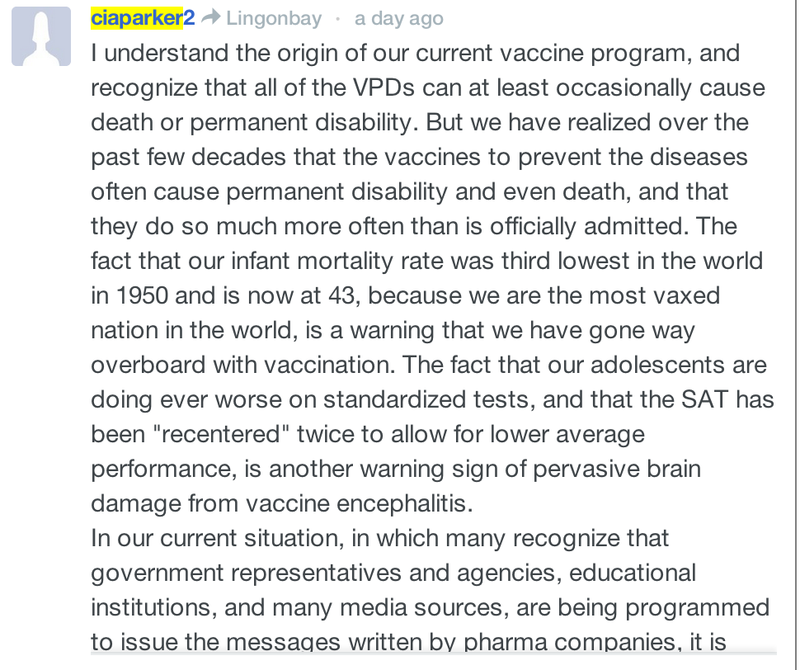 She could leave the vaccine skepticism to people who go to school and learn about immunology, biology, microbiology, and virology and earn degrees after having their “research” tested over and over again to make sure that they’re doing it right. 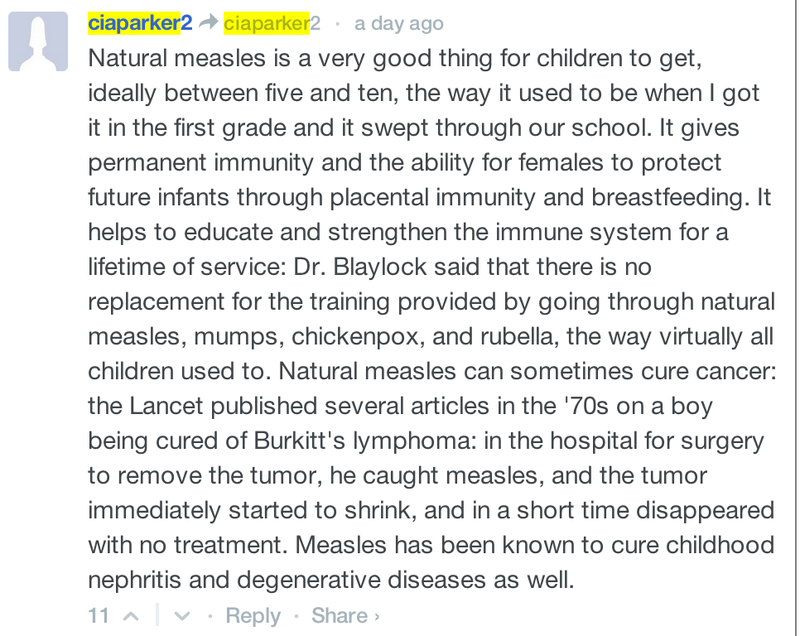 Instead, she chooses to be worried and anxious about her friends’ children who are NOT sick from vaccines, who DO NOT fit the description of vaccinated children that we see day after day in anti-vaccine blogs and videos. I almost want to reach out, hug her, and tell her that healthy children are an okay thing in this world, not something to feel overwhelmed about. I used to know this guy in college who was a true social chameleon. He could adapt to any situation and interact with almost anyone. Of course, this required him to lie about himself from time to time, and he did it more often when interacting with women he wanted to impress. He was employed when the girl in front of him talked about money. He was unemployed when the girl showed hints of being all about fighting “the man”. He grew up in the inner city with tough girls and out in the country with small town girls. It was like watching performance art. 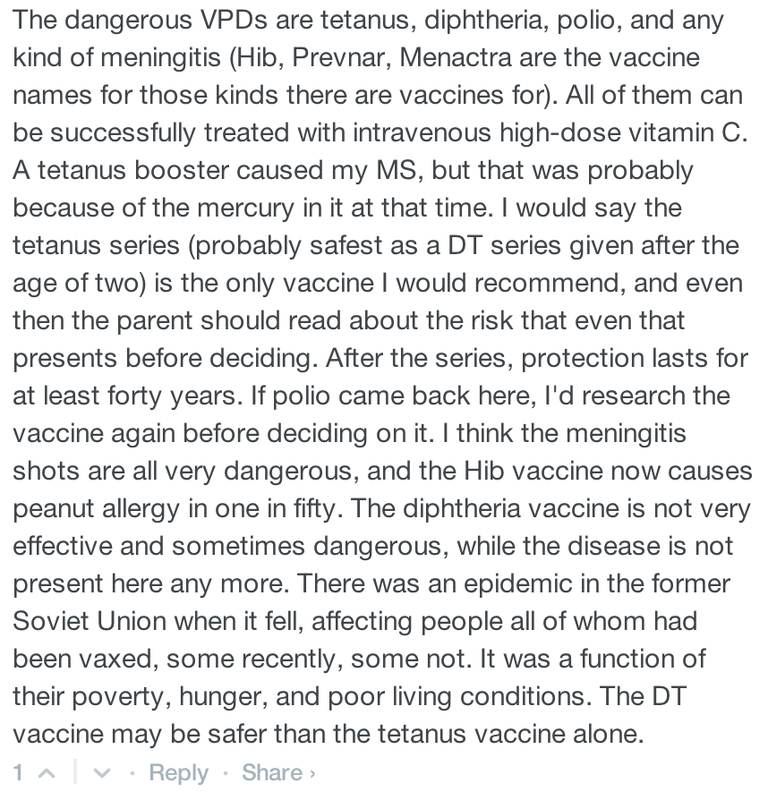 There is a woman who appears at almost every anti-vaccine blog, in the comments section, and displays a similar ability to adapt to the situation. The only problem with her approach is that we can see what she wrote previously, and we can confront her statements with her own statements. 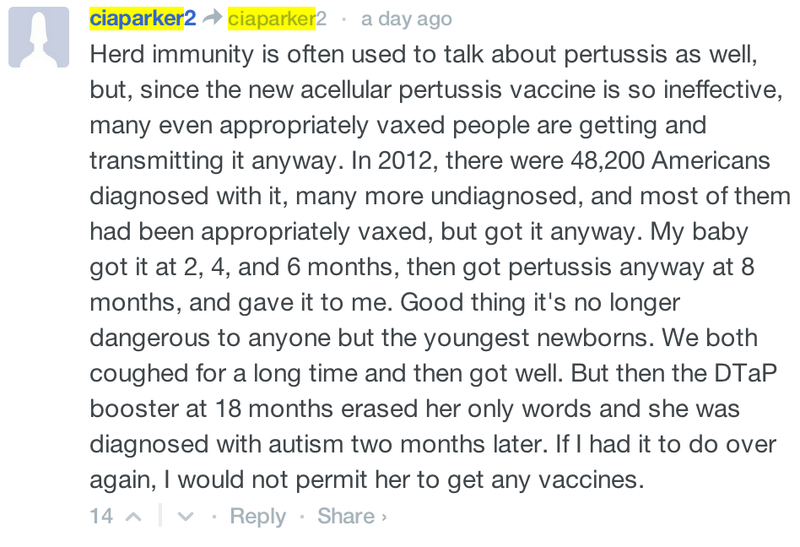 One week she had X disease cause by vaccines, natch. The next week, she had some other disease, also caused by vaccines. A few weeks ago, smallpox was never eradicated. Rather, it was changed to chickenpox and, thus, is still around. Last week, smallpox was eradicated, but the vaccine used caused more deaths than smallpox did. You can see the kind of game she plays. Not only that, but she tells anyone who’ll listen that vaccines have zapped her energy, that she can’t work anymore, but she writes on and on and on in comments sections. And, judging by the time stamps in those comments, she does this for hours at a time, even days. And when someone points out to her that she sure seems animated for a person who is so devoid of energy, she then blames vaccines for her anxiety and her willingness to risk her life to tell others about the dangers of vaccines. Perhaps the icing on the chameleon cake is that this woman is a lawyer when she needs to, then she’s something in the medical field (e.g. 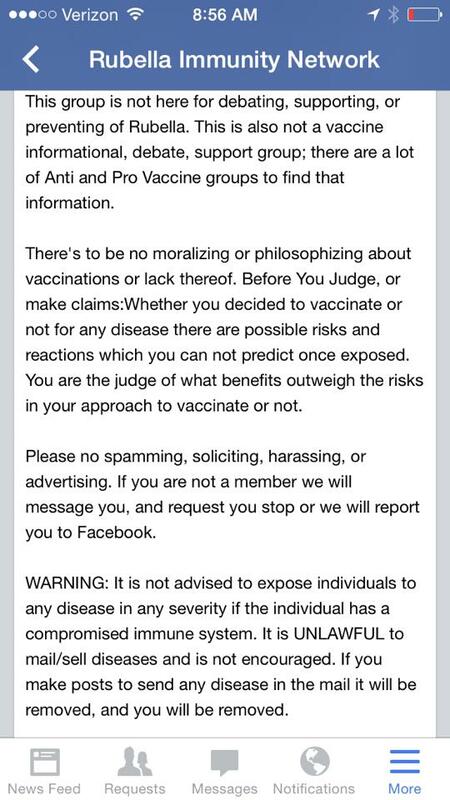 a nurse), and then she pulls out some other degree when her own dubious comments about vaccines are challenged. Let’s put all that aside and really dive into the strange and twisted world this woman lives in. 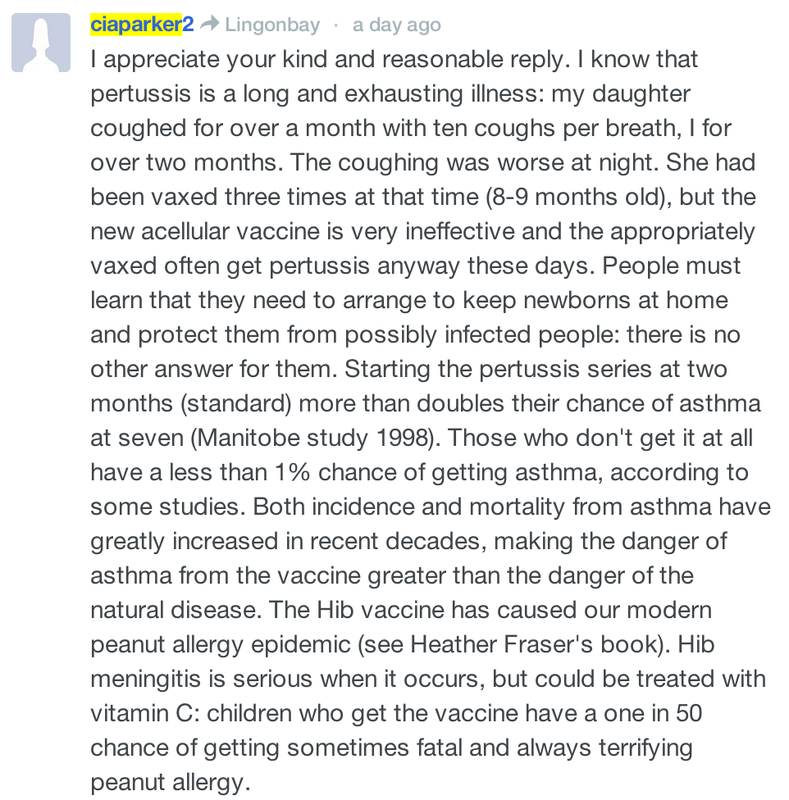 Hers is a world where serious diseases like whooping cough and H. influenzae meningitis can be treated easily with Vitamin C. Hers is a world where her autistic child is worse off than the children who have complications from vaccine-preventable diseases. 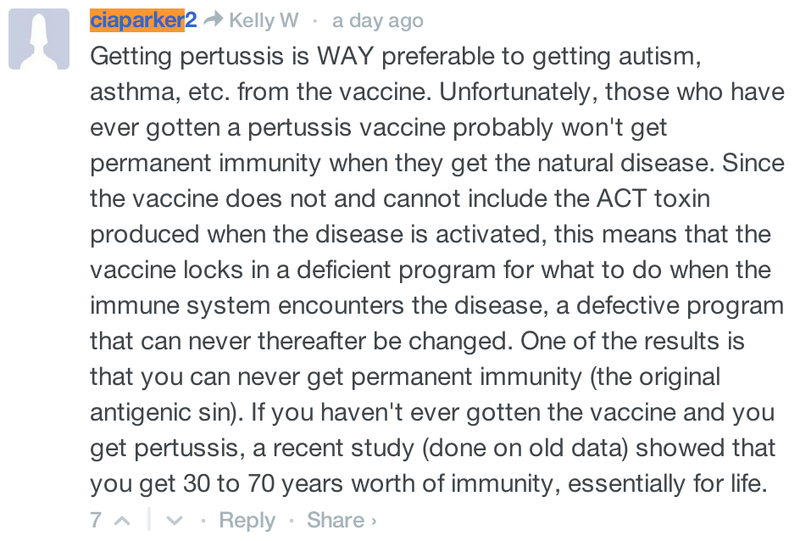 That’s right, autism is much worse to her than a child who loses limbs from meningitis or loses their hearing or dies. She’s one of those parents who should walk away from their child before she does something stupid, rather than just writing tons of stupid. 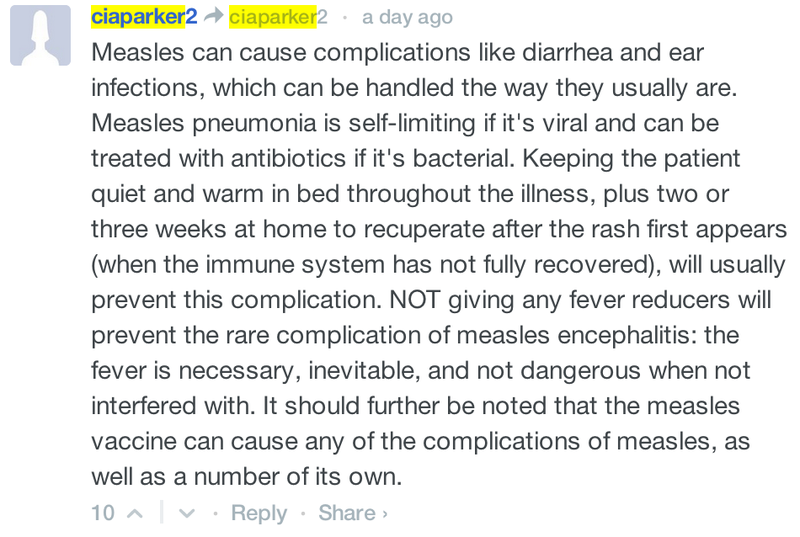 CIA Parker hit all the anti-vaccine talking points, didn’t she? She does it a lot. 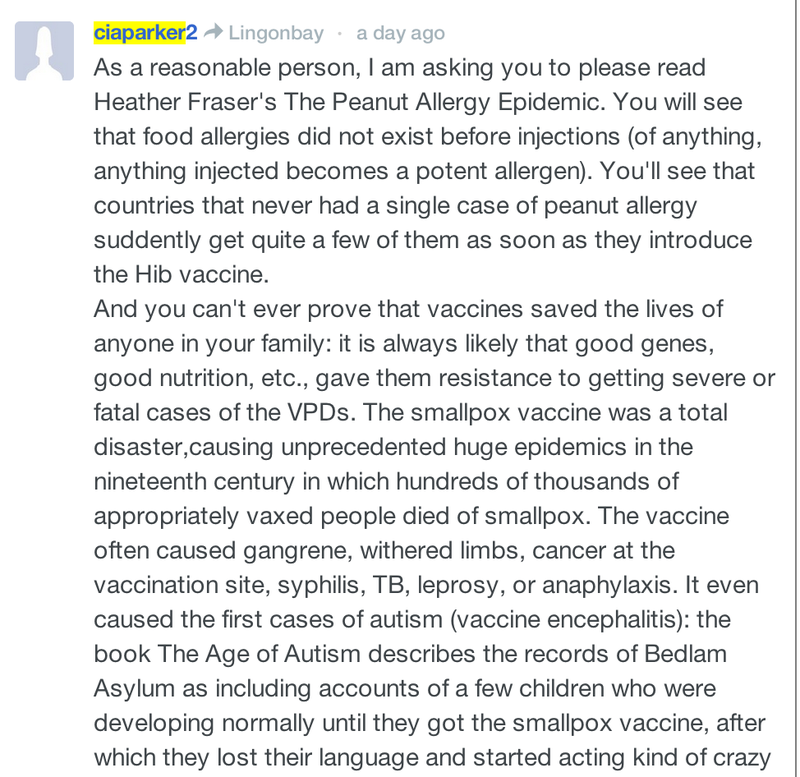 Vaccines cause death, destruction, mayhem, peanut allergies, multiple sclerosis, cancer, and, of course, autism in her world. It’s a scary, dark world of hers. I don’t know about you, but I’d rather live in a world lit up by truth and reality, where the light of science scares away people like her into hiding and only spouting out that garbage. 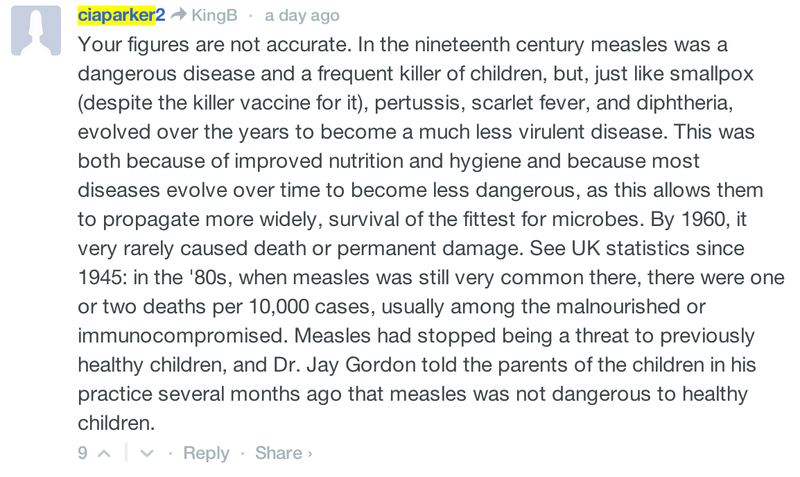 I’ve told you before what German measles (Rubella) can do to an unborn baby. Lucky for us, the virus is covered in the MMR vaccine, a very good vaccine with a very good record of safety and effectiveness. We’re also lucky that the virus only has us as its reservoir. Immunize enough of us around the world, and the virus is eradicated. Period. Unfortunately, there are people out there who more than likely have a mental disorder. Why a mental disorder? 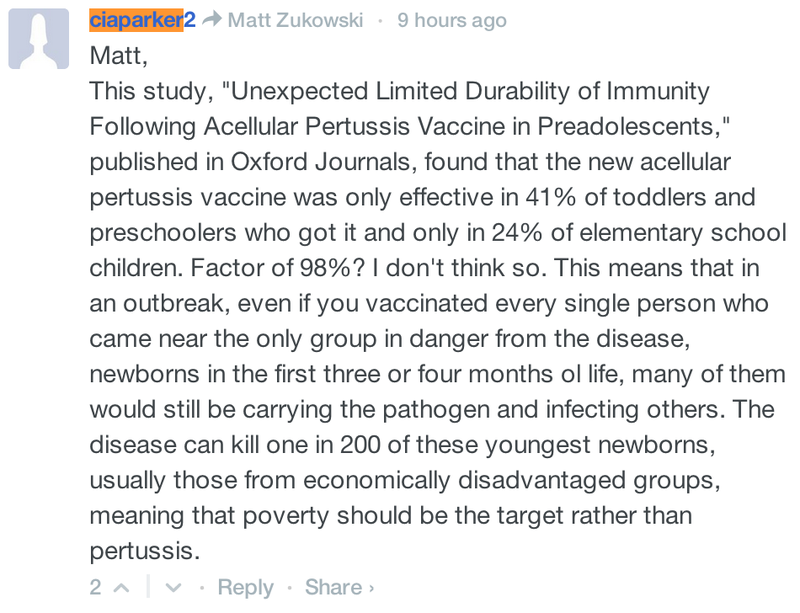 Because only psychopaths would knowingly endanger others and knowingly spread rubella (or mumps, or measles). Let me make this clear: Pregnant women have a diminished immune system, and they are very susceptible to these infections. If you spread rubella, or any other thing, you risk killing a child in the most painful way possible. 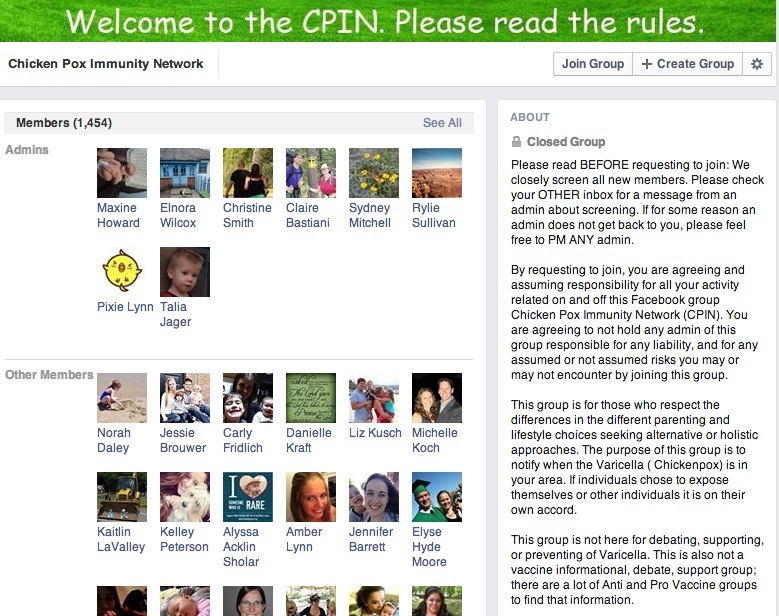 These psychopaths go on social networks and network with each other, agreeing to report to each other if someone in their unvaccinated families contracts measles, mumps, rubella, or chickenpox. They then coordinate parties to get their children, and each other, exposed to these diseases. In some cases, they even agree to mail each other lollipops that sick children have licked. I am looking into each and every one of those names there, and I will not hesitate to contact the proper health protection authorities in the places where they live. The threat is just too great. 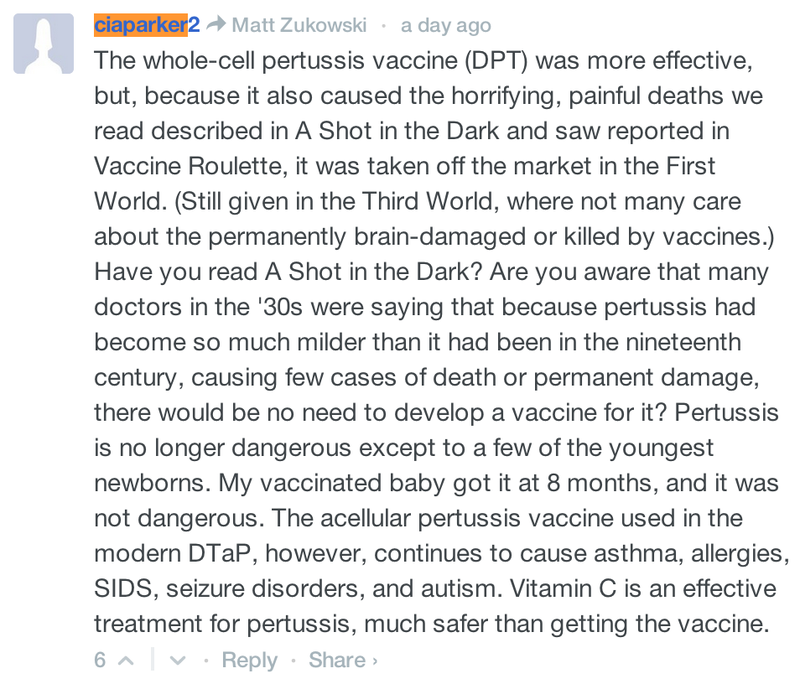 And, by the way, you psychopaths out there, if you’re reading this, the reason you’re having to resort to these idiotic tactics is because of the safety and effectiveness of vaccines. “When I look at pictures of Nick at 8 months old, happy, healthy, and then at 18 months old suddenly vacant, sickly, and sad . . . the word “stolen” flashes through my mind. “I’ve spent the past eight years bargaining with his kidnappers, trying desperately to bring him home. Yes, he’s sitting next to me while I type this, and, yes, these days he is present and ‘with us’ emotionally 95% of the time. But what of his future has been stolen? What of his future health? What about the devastating trauma we have endured? What if I can’t really get him back? Yeah, the sickest. That’s why childhood mortality is at an all time low. 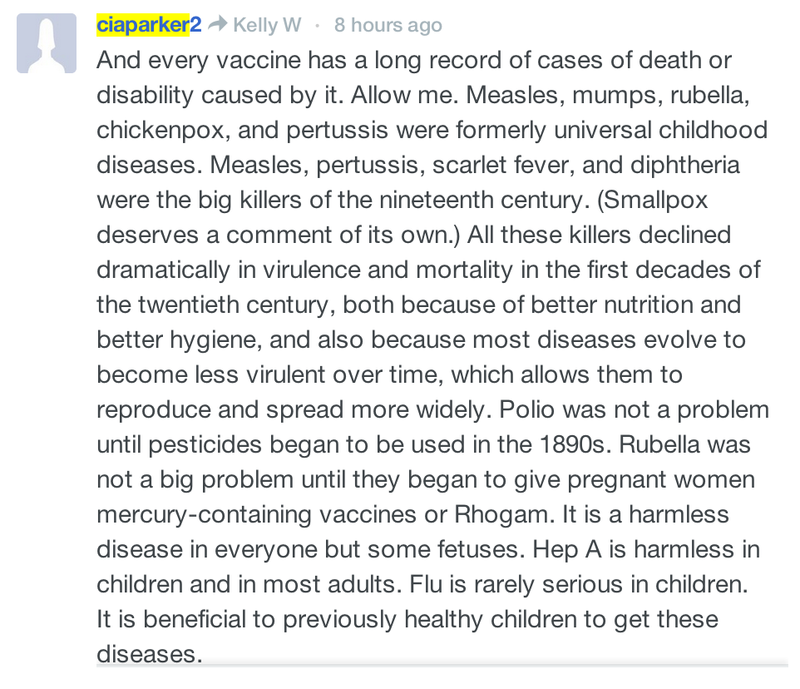 That’s why chronic diseases of adults are now the number one killers instead of, you know, childhood diseases. That’s why we’re making technological advances by leaps and bounds generation after generation, because we’re getting dumber or less mentally adept. Yeah, that’s why. Of all the people who I think should walk away from their children, I think Mama Mac is right up there. Not only is her child “lost” to her, but the child has been taken by a monster under her bed. Last time, I told you about an anti-vaccine activist who seems to have some “issues” when it comes to his mental health. Why is it my opinion that he does? Because he has made it his life mission to try and get a law school professor fired over her pro-vaccine activism. In that last post, I showed you how he put her school’s contact information out on the web for anyone with an anti-vaccine bone in their body to go after her. Well, I learned today that he has taken the crazy level all the way up past ten and into 11.